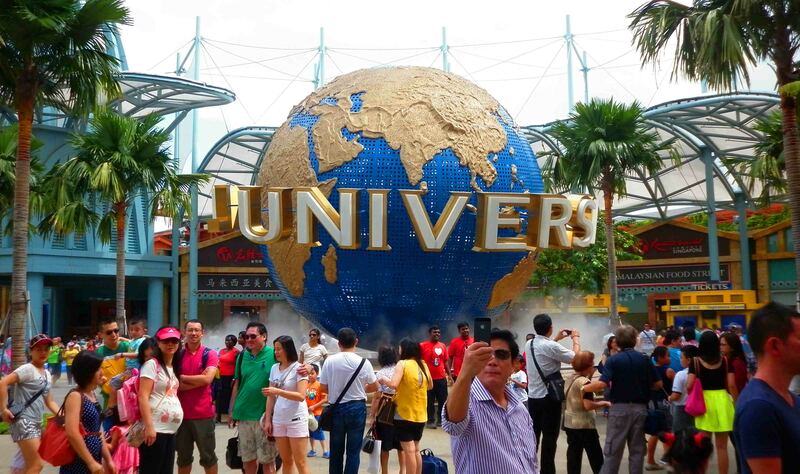 Yeah so here we are again and this time I thought I’d look for some ultimate fun – theme parks! There’s a big kid inside me still – and the idea of going to a theme park still sounds pretty exciting. 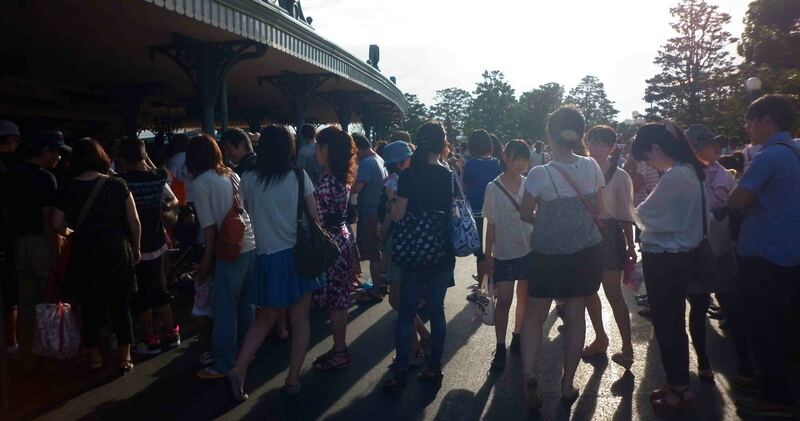 Even if the last one I went to was a bit of a disappointment – Tokyo Disney Sea. 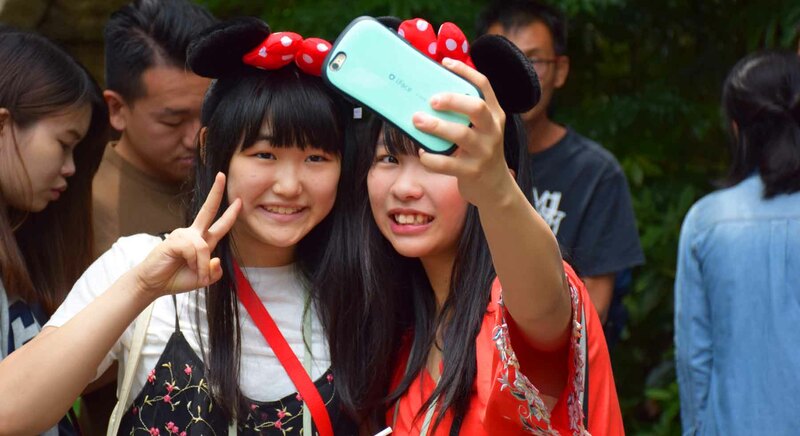 Posing for selfies, popular at all Disney Theme Parks! So a rough list for you from which I select 3 for today – Tokyo Disney Sea, Tokyo Disneyland, Disneyland California, Universal Studios Los Angeles, Universal Studios Singapore, Warner Brothers Movieworld, Sea World (both on the Australian Gold Coast)… actually I think that’s it. Which three meant the most to me? So apparently DisneyWorld is bigger and the ultimate in Disneylands, but I think Disneyland in California was the most special I’ve been to – even if I had more fun at Universal Studios. And that’s because of its name, its history and the familiarity it brings. 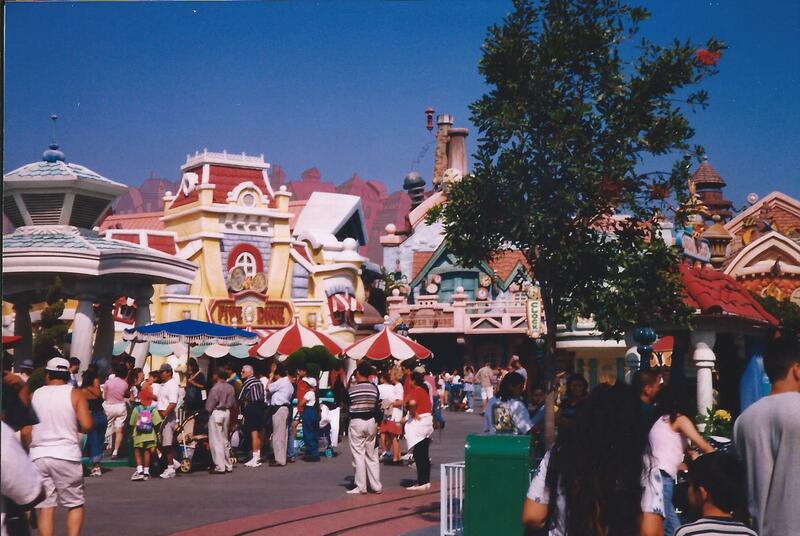 It was 1999 and it was my first BIG theme park. I had visited Sea World on Australia’s Gold Coast as a kid, and that I remember being fun (except for the big pirate ship ride, I will NEVER get on one of those again), but Disney is, without a doubt, special. I can’t say I remember a lot, only that it was surprisingly cheap – $45 US for the day I think, and I think the hostel ran free shuttles. If I went today I would photograph and video the c&^% out of it, but as it stands I only have a couple of ropey photos. I know I had a pretty special day at the very end of my 1999 round the world trip. It is, pretty much, the ultimate way to end a round the world adventure. This was more recent, I went there in 2013 I think it was. Singapore is an incredible place with incredible experiences for the tourist, although you will pay for them all! Nevertheless, USS was a great experience and I spent a whole day taking awesome rides. 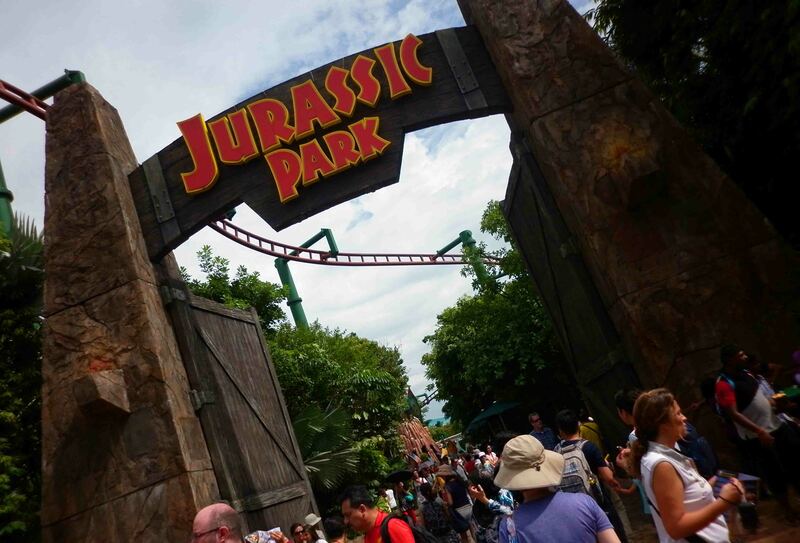 The heat and humidity are rather stifling in Singapore, but you certainly notice it less in a theme park. It’s very well done and efficient, and the location is great. Sentosa Island is full of weird and wonderful futuristic creations itself, it’s the perfect spot for such a theme park. 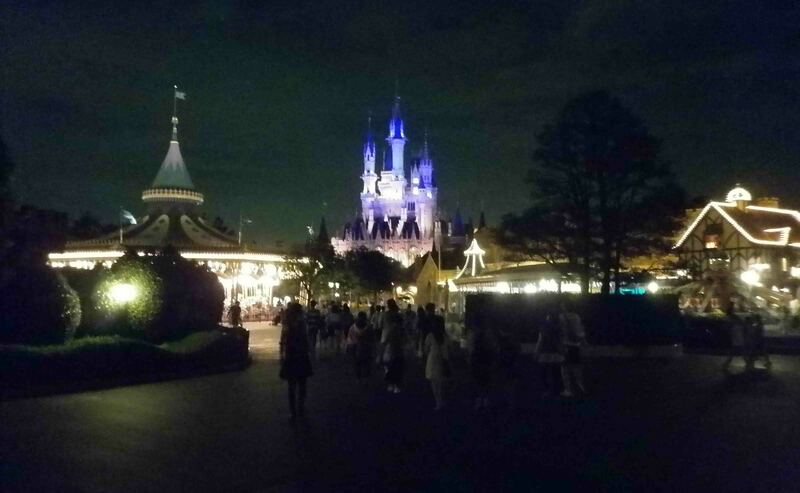 Night view at Tokyo Disney Land. 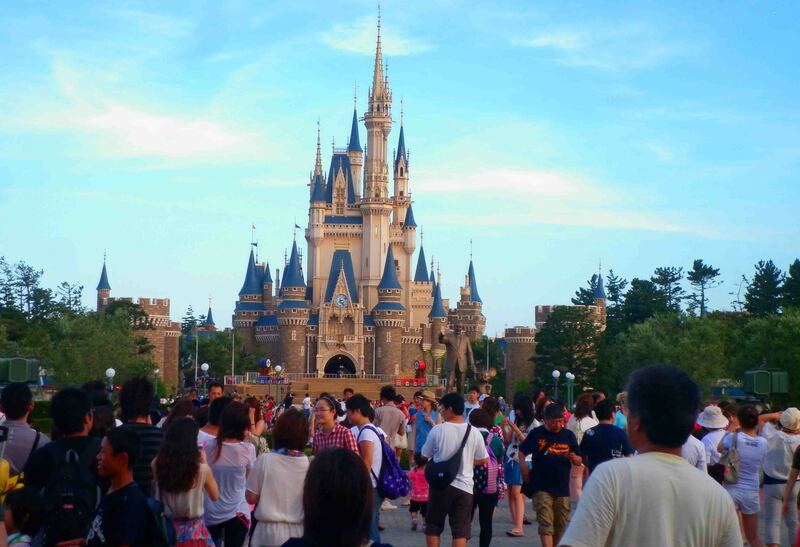 There seems to be something that links theme parks to Japan. I mean Disney built two side by side which are almost always pretty packed out. Although Tokyo DisneySea was a little disappointing, it was still a good day. It’s just that I wanted to be back at Tokyo Disneyland, a short Disney train ride from its slight wetter brother. In Japan you buy your tickets from convenience stores, I think 7Eleven is the place to go. It is roughly 7000 yen for a day pass to one of the parks, and you can get a ticket for around 60% of that that lets you in after 5pm. And if it’s summer it won’t be hot and that still gives you 5 hours of Disney fun! 7000 yen I guess is around $63 US, which is not too bad for a full day and all the rides you like. On a ride in Disneyland. Can’t remember which – perhaps ‘It’s a Small World’. And that’s why I preferred this to DisneySea in Tokyo, there were more rides adults would like, more thrills. And it’s this bizarre mix of Disney, which is very cheesy American in its way, and Japanese. Yeah, it’s strange hearing ‘It’s a Small World’ in Japanese, but then it’s kinda natural in its own way. 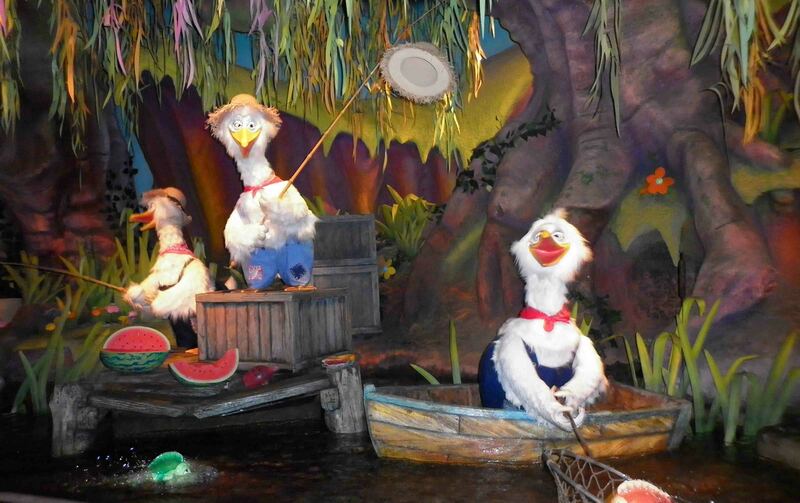 And frankly, I could spend all day riding Splash Mountain! So… I would happily go back to any theme park, nevermind I am in my 40s! and there’s still a few I haven’t been to, from Dreamworld on the Gold Coast, to Disneyworld Florida, Disneyland Paris and one I MUST get to next time I head to Japan, Universal Studios Japan in Osaka. How about you? Do you love theme parks and what are your favourites? Please comment – and May the Journey Never End! The first time I went to Sea I quite enjoyed it, but it wasn’t open long and still wasn’t getting the traffic so we didn’t have to queue for anything. It was such a welcome change to Land where you have to queue for everything. But last year we went back to Sea for the first time in 10 years and it was a disappointment really. The atmosphere just isn’t the same as Land but yet the queues are now as bad, if not worse, than Land 😦 I’ll be sticking with Land from now on!